I've tried a few grafts before; but all were on trees I didn't plan to keep, or in places where it wouldn't bother me much if the graft didn't take. The graft I did Monday, tho, was different. 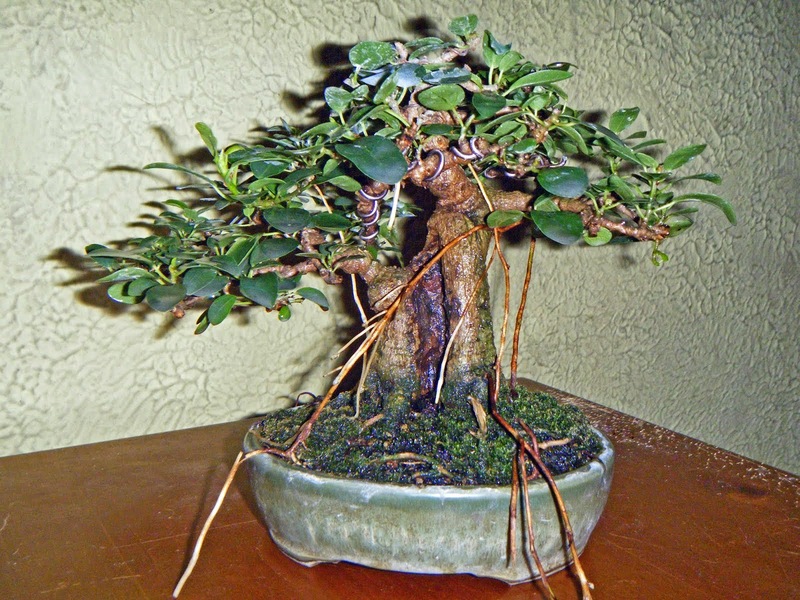 If it should fail, one of my favorite bonsai-in-training will be two-dimensional for a number of years to come! "...Bringing pleasure and inspiration ... after we are gone..."
Yesterday, May 12th, the Fort Wayne Bonsai Club held our annual Spring Show, at the Foellinger-Freimann Botanical Conservatory in downtown Fort Wayne, Indiana. Yes, the venue's name is a mouthful, but the good thing is that the Conservatory is as well-designed and appealing as its name is intimidating. "Show" may not quite convey how informal this event is. There is no judging, except that each visitor is asked to leave a little square of pink paper beside the composition he or she likes the most. (Tallying the slips at the end of the day also gives us a pretty good idea of how many people came thru.) Club members also vote, separately and anonymously, for "best tree." There are no prizes, just congratulations to the winners. We ask that entries be in bonsai pots (please, no plastic) or on slabs, and that members clean up their trees and pots beforehand. And that's it. So maybe it would be better to call it a "display" than a "show." But whatever you call it, we had a great time. Maybe more important, the visitors appeared to find it all interesting. Between conversations with visitors, I snapped a few pictures.